Fabreeka provides low frequency vibration isolation systems for critical testing applications in the aerospace/defense industry, which require ultra-low frequency isolation. Applications often include nano-type measurements and can have error budgets within microns or tenths of arc seconds. When performing testing of large spacecraft or hardware that will be launched into orbit, it is necessary to conduct testing in a space-simulated environment. To achieve this, a vacuum chamber or thermal vacuum chamber is used, which creates an environment to simulate the pressure and thermal effects of launch or space travel in orbit. In cases where the size of the chamber, or the existing chamber, does not allow for “external” isolators, the test payload must be isolated inside the chamber. 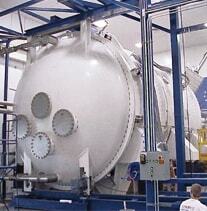 To achieve this, a vacuum compatible isolation system is used. When isolators are used inside a vacuum chamber, they must meet strict material specifications to limit outgassing and be constructed to meet particulate and molecular cleanliness requirements as well. Additionally, in thermo-vacuum applications, the isolators may be required to operate in temperature extremes where heater blankets are necessary to keep the isolators at an operable temperature.